Jose Garces' Ortzi, located in midtown's LUMA Hotel Times Square, is a 50-seat restaurant with an open kitchen and a brick oven. On the menu are dishes like rabbit stew and hamachi with piquillo pepper, along with wine and cocktails. Breakfast, Lunch & Dinner daily. Ortzi, LUMA Hotel Times Square, 120 W. 41st St., New York, NY 10036, 212-730-0099. Chefs Aidan O’Neal and Jake Leiber cooked together at Café Altro Paradiso, and now they're reunited in the former Jimmy’s Diner space in Greenpoint. Chez Ma Tante pays homage to a hot-dog-and-French-fry shack in Montreal, and serves dishes like marinated mussels and clams and poached chicken with aïoli and carrots. Dinner nightly. Chez Ma Tante, 92 Calyer St., Brooklyn, NY 11222, 718-389-3606. Named after the term for 1920's Japanese flappers, Bar Moga serves comfort food like ramen and bifuteki skirt steak with fried fingerling potatoes. Creative cocktails include the “Sleepwalk,” with lemongrass shochu, Yuzu Omoi, coconut, ginger, lime and rosé. Dinner nightly. Bar Moga, 128 W. Houston St., New York, NY 10012, 929-399-5853. Fusco restaurant by chef Scott Conant is named after his grandmother, Carminella Fusco Varrone. The Gramercy spot offers a seasonal Italian menu featuring dishes like short ribs with fava bean salsa verde and horseradish, and escolar with black rice, cuttlefish and oxtail sauce, both available à la carte or as part of a tasting menu. Dinner nightly. Fusco, 43 E. 20th St., New York, NY 10003, 212-777-5314. At 33 Greenwich, chef Anne Thornton (formerly of The Waverly Inn) takes her inspiration from the flavors of the South, from the Carolina coast down to New Orleans. She offers dishes like a dry-aged meatloaf burger and lamb T-bone with stewed tomatoes and roasted okra. 33 Greenwich, 33 Greenwich Ave., New York, NY 10014, 646-609-3615. In the Brooklyn Botanic Garden's glass-and-steel Palm House, Yellow Magnolia Café serves veggie-centric dishes crafted with seasonal ingredients sourced from local farms and purveyors. The spot is run by the Patina Restaurant Group in partnership with chef Rob Newton, who cooks chicken with ramp dumplings and fiddleheads, and fish tacos with cilantro and radishes. Lunch daily. Yellow Magnolia Café, Brooklyn Botanic Garden, 990 Washington Ave., Brooklyn, NY 11225, 718-307-7136. Affordable Park Slope sushi spot Sushi Katsuei has opened an outpost in the West Village. The restaurant serves three omakase options, plus saké, beer and sparkling wine. Sushi Katsuei, 357 6th Ave., New York, NY 10014, 212-462-0039. Badshah, from Abishek Sharma (Swagat, Surya) and former Babu Ji executive chef Charles Mani, highlights the flavors of Indian street food. Look for dishes such as mussels in a spiced tamarind and tomato broth, and Indo-Chinese Colonel Tso's cauliflower. Dinner nightly. Badshah, 788 Ninth Ave., New York, NY 10019, 646-649-2407. The Spaniard in the West Village is from the team behind Bua and Wilfie & Nell. Helming the kitchen is Ai Fiori vet PJ Calapa, who offers dishes such as buffalo duck wings, lobster toast, and barley and butternut squash risotto. Food is available daily until 2 a.m. Dinner nightly. The Spaniard, 190 W. 4th St., New York, NY 10014, 212-918-1986. Indonesian food is scarce in New York City, which makes the opening of Awang Kitchen on the busy corner of Queens Boulevard and Broadway in Queens exciting. The restaurant serves dishes like coconut-marinated fried chicken, baby goat satay and grilled cow tongue topped with green-chile relish. Lunch & Dinner daily. Awang Kitchen, 8405 Queens Blvd., Ste. 1C, Elmhurst, NY 11373, 347-492-9264. 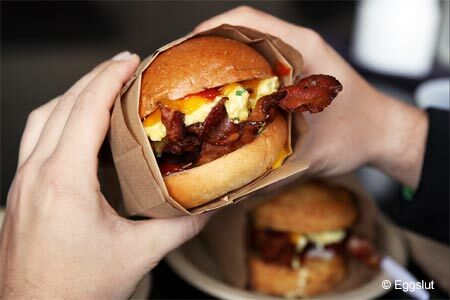 Los Angeles breakfast sandwich spot Eggslut has arrived at Chefs Club Counter in NoLIta. Its signature Fairfax offering is eggs scrambled with chive, topped with cheddar, sriracha mayo and caramelized onions and served on an Eric Kayser roll. Breakfast daily. Eggslut, Chefs Club Counter, 62 Spring St., New York, NY 10012, 646-438-9172. Sichuan restaurant Birds of a Feather has soft opened in Williamsburg, serving dishes like poached pork belly-wrapped okra and Japanese tofu finished with thousand-year egg. This Grand Street newcomer is from the people behind Midtown East’s Café China. Dinner Tues.-Sun., Brunch Sat.-Sun.. Birds of a Feather, 191 Grand St., Brooklyn, NY 11211, 718-969-6800. Chef de cuisine Chad Brauze helms the kitchen at farm-to-table restaurant Bevy, located on the third floor of Park Hyatt New York. Expect creative cocktails and dishes such as Montauk fluke tartare and, to share, a bourbon-brined Green Circle chicken and a 40-ounce dry-aged bison rib-eye. Dinner Tues.-Sat.. 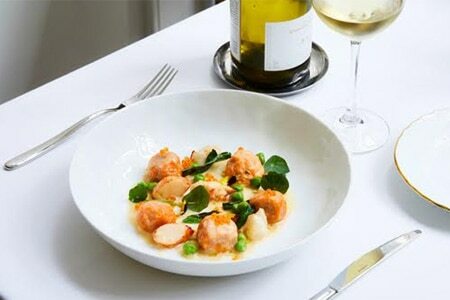 Bevy, Park Hyatt New York, 153 W. 57th St., 3rd Floor, New York, NY 10019, 212-897-2188. Owners Brett Nidel, Sam Nidel, Tamara McCarthy and Matt Mogil, the team behind The Commons Chelsea, have opened Motel Morris, a New American restaurant. Chef Bill McDaniel, formerly of The Red Cat, serves dishes like chili charred octopus with Chinese sausage and everything bagel-crusted tuna at this Chelsea spot. Motel Morris, 132 7th Ave., New York, NY 10011, 646-880-4810. Danish entrepreneur Claus Meyer and Swedish chef Fredrik Berselius have opened Norman, a 140-seat restaurant in Greenpoint. Chef Andrew Whitcomb helms the kitchen. Self-service breakfast and lunch dishes include steel cut oats, a slow roasted pork sandwich and a maitake mushroom tart. Breakfast & Lunch daily. Norman, 29 Norman Ave., Brooklyn, NY 11222, 347-966-2092. Avocaderia will open in Brooklyn’s Industry City Food Hall on April 10, 2017. Francesco Brachetti fell in love with avocados while living in Mexico, and here he will offer salads, smoothies, ceviche and toasts, all featuring avocado. Avocaderia, Industry City Food Hall, 254 36th St., Brooklyn, NY 11232, 415-702-8806.